Preliminary Chart of Calibogue Sound and Skull Creek forming inside passage from Tybee Roads to Port Royal Sound South Carolina. This is an appealing 1862 U. S. Coast Survey nautical chart or maritime map of the Calibogue Sound and Skull Creek, South Carolina. 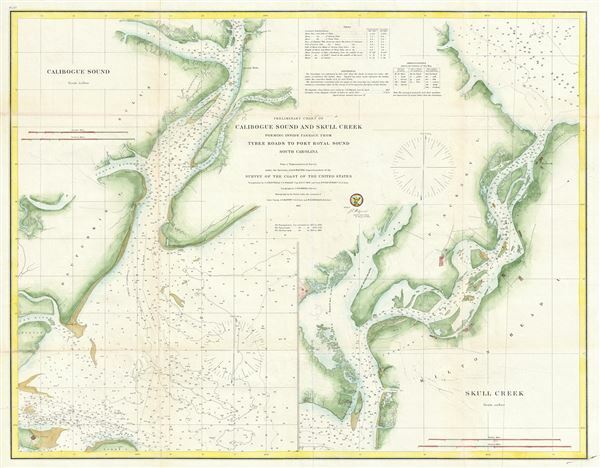 Essentially divided into two sections on the same sheet, the section on the left half of the sheet focuses on Calibogue Sound from Tybee Island and the Savannah River north past Daufuskie Island and Bull's Island to Jarvis' Creek. The right section, centered on Pinckney Island, focuses on Skull Creek from Jarvis Creek north as far as Port Royal Sound. Countless depth soundings are noted in feet along with several notes on tides and other practical information for the mariner. Little inland detail is offered. The triangulation of this map was conducted by C. O. Boutella, C. P. Bolles, E. O. C. Ord and D. T. Van Buren between 1851 to 1859. The topography was conducted by C. Rockwell. The Hydrography was accomplished by parties under the command of J. N. Maffitt and W. S. Edwards. The whole was compiled under the supervision of A. D. Bache, one of the most influential American cartographers of the 19th century. This chart represents plate no. 27 in A. D. Bache's 1862 Report of the Superintendent of the United States Coast Survey. Very good. Minor wear and toning along original fold lines. Professionally flattened and backed with archival paper.